This unit has a gorgeous, south-facing patio measuring 26' x 12', 2 private outside entrances to suite plus intercom access.The patio wraps around the front and side of unit. Fully repainted 2 years ago; it shows very well with mouldings and built-ins. It comes with 2 parking stalls. There is attractive laminate flooring throughout and good sized bedrooms and bathrooms, well separated for ease in hosting guests. 2 windows in the kitchen. Interesting angles, feature gas fireplace, open floor plan, lovely to entertain inside and out! This will appeal to the gardener and the person who loves loads of sunlight. It is bright, airy, & beautiful. Pet OK with restrictions, rentals restricted, no age restrictions. 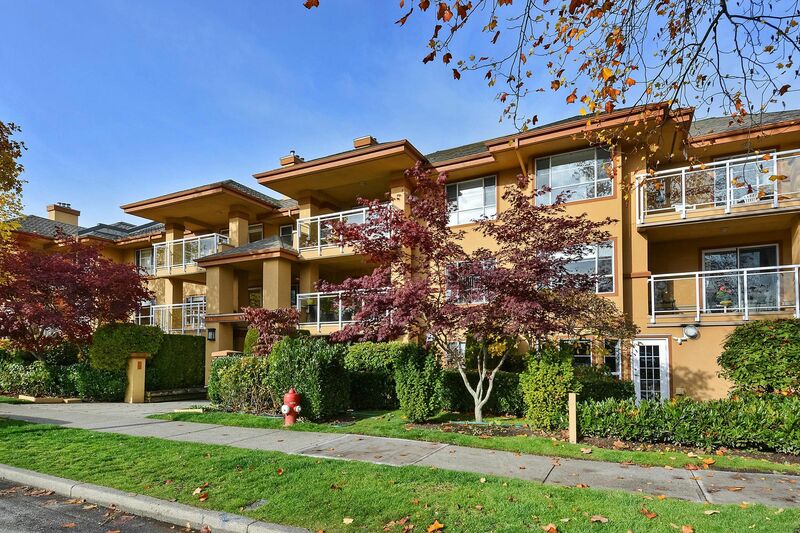 Level walk to all shopping found at Windsor Square and Semiahmoo Mall. One block to Bus 351 to Vancouver, other buses to Surrey. Easy walk to all restaurants, Rialto Theatre, all medical services. Building is located close to the wonderful Semiahmoo Trail, for lovely walks through the woods. No-thru street. PL LMS997 LT 54 LD 36 SEC 15 TWP 1 STRATA LOT AS SHOWN ON FORM 1.